The AP 6 Pot brake kit has been the choice of the RS enthusiast for many a year.Now the New Focus RS Mk2 2009 has the same AP treatment. Give your RS the ultimate in braking power, tested on the track this newly developed this 6 Pot brake kit will work perfectly on the road and on the track. What is the difference betwween the 362mm and 356mm kits ? This brand new edition 356mm kit is has been developed and suppied by AP Racing directly.All other the other kits at 362mm are not genuine 100% designed and supplied by AP Racing but will have AP Racing discs, pads and calipers. Will this kit work better than the 362mm kit ? This kit has exactly the same components as the very very popular BMW M3 CSL brake kit.This has been tested in motorsport and track for many years,this kit also uses a larger pad and stronger caliper than the 362mm kit.So with its roots firmly cast we believe this kit to more suitable for severe Motorsport usage. The Pumaspeed Workshop team are ready to fit the Focus RS Mk2 2009 6 Pot AP (Formula) brake caliper kit 356mm in our Head Office located here. Therefore making parts and labour a total cost £2,694.00 (inc. VAT). 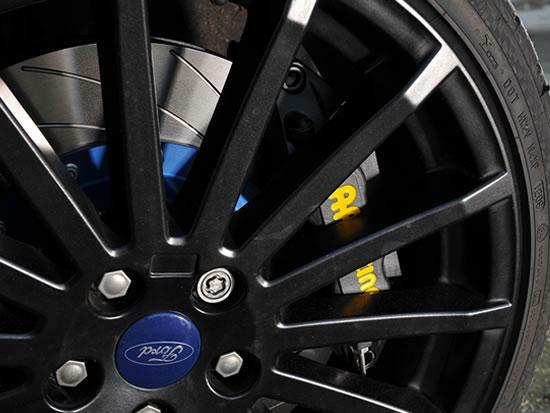 Pumaspeed have a specialist distribution team that can dispatch the Focus RS Mk2 2009 6 Pot AP (Formula) brake caliper kit 356mm to any destination worldwide.